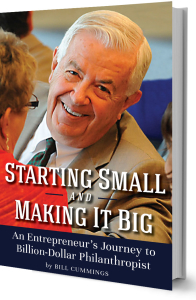 To order Bill Cummings’ book, “Starting Small and Making it Big: An Entrepreneur’s Journey to Billion-Dollar Philanthropist,” please log in to PayPal.com and send $15 to the Friends of Chevalier using the email address friendsofchevalier@gmail.com. Shipping is free. If you don’t have a PayPal account, please email friendsofchevalier@gmail.com and we will make other arrangements for you to purchase a book.